We had a visitor who is a new South Berwick transplant, having lived a bit in Kennebunk and originally from Bosnia where she was involved with Rotaract. Her name is Lena Ugren and she is a graphic designer, artist, bartender, and more. We look forward to seeing her again. Geography Quiz Night is closing in on us. Next Friday the teams will compete for the bragging rights and custom trophies proclaiming them geography geniuses. Thanks to team sponsors who make this all possible and the hard-working Rotarians and Interact-ers who help pull together the event. Robin Wheeler has requested that folks bring in baked goods in baggies that we can sell for $1 apiece (you be the judge for how much to put in the baggie), to supplement the other foods that will be sold there. Also, raffle items are still welcome. See Stan Shapleigh, who is in need of lots of coffee cans if you can bring them to Thursday's meeting. Please plan to come. Keep up the ticket selling for the MEF/Rotary Dance for scholarships scheduled for April 27th. Food Pantry is this Thursday from 6-7:30 p.m. The Blood Drive is April 13th at the Town Hall. There is a District Assembly this coming Saturday, I believe. See President Richard for details and he will make sure your registration is paid for by the club. The electronics fundraiser will take place at Eliot Commons on May 18th. Theresa Tozier was back to tell us about all the great progress Lydia's House of Hope has made. For those unfamiliar with the project, it started out as Seeds of Faith and focused on homelessness. The group involved decided it was best to buy a home in Somersworth that used to be a nursing home, in terrible disrepair but having lots of possibilities since it had 12 bedrooms, large kitchen, meeting areas, etc. With help from kind and generous individuals and companies and organizations, they have established a transitional housing program for women and children that provides vocational and life skills, with the goal of breaking the cycle of homelessness that goes from generation to generation. In August of 2016 they purchased the house and everything about its renovation was donated. What this lovely place gives these women and children is a sense of self-respect and hope. Their holistic program addresses their spiritual, emotional, vocational and physical needs. Their latest addition is a fully-equipped gym in their renovated basement, all donated by Planet Fitness and recently inaugurated by PF and Governor Sununu - a mini-Planet Fitness. Lydia's House of Hope is named after Lydia, a 9-year-old who passed away some years ago from cancer and whose family wanted to create something that would keep Lydia's memory alive. There are now 10 employees, 24/7 coverage, places for residents to grow fresh produce, they cook for each other, they have over 30 programs in-house to improve themselves, and they set goals and keep setting them as they achieve goals, with the ultimate goal being to get off government assistance and be self-sufficient. There are now a number of successful graduates of Lydia's House of Hope. All donations are welcome, as they have an operational budget they need to sustain. We are inspired by Theresa's enthusiasm and dedication to this wonderful program. 2. Robin Wheeler reminded us to help her fill her Bucket of Brew and her Basket of Wine, items to be auctioned off at the MEF/Rotary dance on April 27th. 3. Next on deck is the Geography Quiz Night on April 5th. Be ready...be very very ready... We need most hands on deck. And raffle items, if you've got 'em. 4. Got blood? April 13th at the South Berwick town hall you can give yours. Or you can help if help is still needed. 5. Got junk? If it's electronic, save yourself the transfer station fees and bring them to our tractor-trailer truck that will be parked at Eliot Commons on May 18th. Free-will donations of cash to Rotary for this service will benefit our scholarship fund which is running on fumes. Plus, you are doing the environment good because the folks who collect our stuff will recycle components and harvest useful materials from them. Spread the word so we can fill the truck! 6. The next board meeting was rescheduled to the following Monday. 7. The speaker at our next meeting will be Theresa Tozier from Lydia's House of Hope, a fabulous program that is doing wonderful things. We are grateful to Carol Chapman for inviting her friend and fellow pickle ball player (what is pickle ball - I was too embarrassed to ask - is it played with pickles or balls or both? ), retired anesthesiologist Robert Andelman. He retired after 34 years, having worked at Portsmouth Regional Hospital and Wentworth Douglas Hospital, but he still had plenty of interests and the energy to pursue them. He volunteered at Families First out of Goodwin Health and also serves as a marine docent. What piqued his interest was the suboxone treatment for substance abuse. As a long-time Portsmouth resident he is well aware of the alarming rate of overdoses we are seeing. He researched the suboxone program and wanted to get involved. To do so, he needed his medical license, a federal narcotics license, and a waiver course, in order to be able to prescribe suboxone to patients. The clients at Families First have many life problems and part of the program is to get to know the patients and then take part in team meetings to address their issues. Suboxone is another narcotic, but it's weak and it is almost impossible to overdose on it. However, it stops the craving for other narcotics. It is administered as strips placed under the tongue. Robert is impressed with the safety profile of it and its role as an inhibitor. Whereas methodone programs are 3 strikes and you're out, this one treats the addiction as a chronic illness. He recounted stories of ways this program has restored people to being productive citizens again without the terrible stigma of being categorized as an addict. And most of all, this program saves lives. Jeremy Fogg's PETS (presidential) training last weekend made district history when he and his father Richard were both being trained since they will both be presidents in the 2019-20 Rotary year (not the same club, of course). We are thankful for the Fogg-men's commitment to Rotary. Robin Wheeler bade me to beg for brew bottles for the beer bucket (alliteration, anyone? ), to be auctioned off at the upcoming MEF/Rotary dance in late April. Thanks for bringing those in, along with your wine bottles to donate as well. Speaking of the letter B, Monday is the Board meeting at 5 p.m. at the office of Civil Consultants. Also Brandon Elsemore, who publishes a community newsletter every quarter, is putting together the information for his April-June issue, so if you have anything you would like him to include and announce, please get that information to him. Continuing with the letter B, Bob Andelman, a retired anesthesiologist at our local hospitals, will be speaking to us next week about Suboxone treatment. If you're curious about what that is, be sure to come to next week's meeting. He is Carol Chapman's guest speaker. And finally, concluding our b-alliteration, Sharon Beckwith was our guest presenter at our breakfast meeting. She updated us on the progress Daisy's Children has made. As you may recall, we supported this program in Honduras and most recently Sharon and local helpers worked side-by-side, setting aside religious differences and digging and building a new building for the expanding program. Daisy's Children feeds children before and after school, prepares them for school, and is moving into vocational training for their families. They are now feeding 200 children twice a day at a cost of about $2500/month. We don't know how she manages it, but she says that good people keep supporting their efforts to keep these children from starving. We so admire her and their efforts. We welcomed a number of visitors, including Dave Wheeler, Vickie Stewart, Michael (who is no stranger to our meetings anymore and a past speaker at our club meeting) from Berwick Academy, and our guest speaker John Marshall. Next week's presenter will be Sharon Beckwith who inspired us with the Daisy's Children project in Honduras, to give us an update of developments there. You may recall that we supported them in the past with one of our Geography Quiz Nights. It is always exciting to hear what Sharon is up to these days. Speaking of Geography Quiz Nights, the next one is right around the corner and we are gathering lots of teams and sponsors and raffle and food items and workers for that event, which is on April 5th at the Great Works School. Please consider sponsoring a team, even partially, and/or donating raffle items, food, and your time. Since the project in Zambia is a global grant, every dollar we make towards it will be tripled! We thank those who worked at the food pantry that evening. Also, Stan Shapleigh reported that the most recent news coverage about Molly Banville helped us raise another $1000 to help her out as she continues her medical ordeal in Cleveland. At our next meeting, for those who are so inclined we will be passing the hat for Molly as well. Coming up soon (April 27th) is the MEF/Rotary Scholarship Dance at Berwick Academy. Robin Wheeler passed out 4 tickets to each Rotarian in hopes that each member will sell that many. In addition to the dancing and the light food, there will also be a small live auction. One item will be a basket of wine, so each Rotarian is requested to bring one to help fill that basket. Proceeds will benefit both organizations. Remember to set aside your electronics when we try to fill a truck with those in May. And before we end the year with our Strawberry Festival lobster rolls sale, we will be feeding our Eliot senior citizens again at a special dinner at the Eliot Congregational Church sometime in May. John Marshall had a wild and woolly trip through Colombia with his wife, daughter and daughter's boyfriend. Their itinerary included the colorful and renowned cities of Medellin and Cartagena and an island off the coast of Colombia. Colombia is bordered by 6 countries and although it has a frightening reputation, it has been fine since 2005 and the dollar exchange rate is very favorable. John shared his photos and funny stories about his adventures while there. We are so happy he survived the plankton tour! -- Comedy Night in support of the Marshwood Interact Club's service trip to Peru will be well attended by 14 of us Rotarians and spouses. -- The Geography Quiz Night of April 5th is moving along nicely. -- Next week incoming president Jeremy Fogg will be at PETS to learn about becoming a club president. -- Our club will be supporting 6 students at RYLA (4 from Marshwood and 2 from Berwick Academy). -- The Berwick Academy chartering ceremony took place last Friday. Here is proof. -- The Rotary/MEF dance is in the planning and we will be dancing up a storm at Berwick Academy on April 27th. -- We will sponsor a blood drive at the Town Hall in South Berwic on April 13th from 8:00 a.m. to 1 p.m.
-- We have ordered the dictionaries for the third graders, including Berwick Academy students. -- The date for the electronics drop-off fundraiser is May 18th, so start gathering yours to drop off that day. Sue Repco (sp? ), an Eliot resident and English teacher at Phillips Exeter Academy, spoke to us about the Be SMART program promoting gun safety organized by Mothers for Gun Safety in America. It reminds us of the importance of keeping guns out of the hands of children and teens, because, if not, then something terrible could happen that would have been completely avoidable. Sadly, the United States has the high gun fatality rate in young people among all the developed countries of the world. SMART stands for 1) Secure all guns, 2) Model responsible behavior, 3) Ask about the presence of firearms where young people are, 4) Recognize risks of suicide and mental illness, and 5) Tell everyone to be SMART about guns. We welcomed Berwick Academy's Interact Club Advisor, Jen Onken, who took time out of her busy schedule to tell us about the great things her group of service-oriented students are doing. At any given time there are about 100 students chipping helping out on a large number of projects, such as 1) providing towels at the Penguin Plunge, 2) meal preparation for families in Rochester, 3) supporting the Ebenezer School in Milot, Haiti with fundraisers for two students there, 4) a service trip to Haiti to bring supplies they have gathered, 5) tutoring in Dover, 6) packing items to be sent to soldiers, 6) picking apples to give to End 68 Hours of Hunger, 7) making blankets for the Linus Project, 8) baking and cooking for Table of Plenty, and much more. Jen's personal history is full of service to others, having served on the Peace Corps in Lesotho, Egypt and Lebanon. Since settling down with her family that international excitement has diminished in their lives, but she still hopes to enjoy international experiences like that in the future. We are fortunate to have such a wonderful role model for the students at Berwick Academy. We'll see them at the Geography Quiz Night and, before that, when President Richard and club liaison to that group, Skip Cousens, attend one of their meetings to present their charter to them. They will be sending students to RYLA this summer, too. Both they and Marshwood Interact would like to send more than the 4 we have budgeted for, so we need to think about that (good) problem. Robin Wheeler reported that the mini-fundraising for the Coast Guard families provided more than $370 in food and supplies before the government shutdown ended. Thank you for your generosity, everyone! Skip Cousens reported that the global grant we will be supporting with the Geography Quiz Night proceeds is called "Healthy Kids - Bright Future" and provides school-based healthcare to families in Zambia. That event is April 5th and we are putting the teams together now. Both the Portsmouth and Kittery clubs also wish to send teams. March 1st is the comedy night at Spring Hill organized by the Marshwood Interact Club to help defray the costs of their service trip to Peru. We will be having a good group of Rotarians socializing that night. See earlier emails to get your tickets from Grace Jacobs so you can join in the fun. See you all on Thursday! Stay safe during the snowstorm. President-elect Jeremy Fogg summarized the board meeting of January 21st, where they discussed the next events (Geography Quiz Night in early March, electronics fundraiser the second or third week in May, the MEF/Rotary scholarship dance at Berwick Academy in early May, the dictionaries project for third graders, and the district assembly in June which is a picnic in a park in Portland (the board voted to pay the $300 so any member can go there for free and even accompanied by family members). There is also a South Berwick website called "In the Loop" where community members may share information, so we will look into publicizing our activities there, too. This site is often used by folks who work from home. Thanks to Robin Wheeler we all gathered food items and monetary donations, including auctioning off donated Girl Scout Cookies that raised over $120 (thank you, Deb DeColfmacker and auctioneer Hap Moore), to help our Coast Guard neighbors who have had to struggle to put food on the table due to the government shutdown. Robin will be doing the shopping and bringing the items to the person organizing this at the Portsmouth Naval Shipyard. As for the morning program, it was another of those "3 minute drills" where club members who haven't yet done so spoke for 3 minutes about anything. Jeremy Fogg spoke about an exciting arts conservation project of the Richardson art collection and their building in Woburn, MA (it opens in March). Derek Ahl talked about Tai Chi. Jim Hamilton, the new Berwick Academy Head of School, spoke a bit about growing up in Hyde Park, Massachusetts, the son of a Vietnam War veteran, his education, family life, and professional journey. Carolann Gagne talked about her family and especially her wonderful father in Indiana who has been a great role model for her and with whom she has been spending time when not with us at Rotary. Helen Goransson went into a Hamilton rant that caused everyone's eyes to glaze over. Last but certainly not least, Stan Shapleigh reminded us that this year's motto is "Be the Inspiration" and he told the inspirational story of Peter the Pirate that had us rolling in the aisles with laughter. What a group! Our next speaker will be Jen Onkin from Berwick Academy on February 7th. Tributary Brewing Company is located at 10 Shapleigh Rd., Kittery, ME 03904 (207-703-0093). 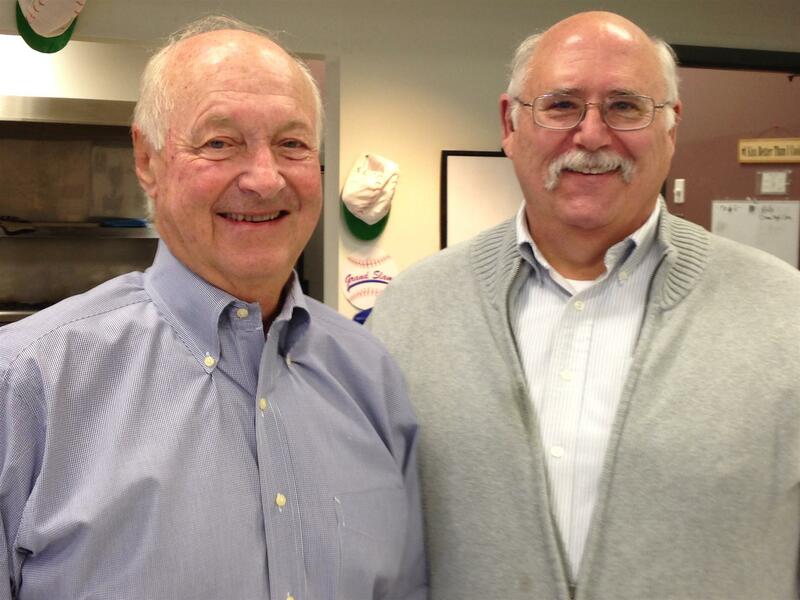 The Motts who own and run the Brewing Company are South Berwick residents. Come and have a pint or two with some hors d'oeuvres and enjoy each other's company. Time will be 5:00- 7:00 p.m.
First Rotattler of 2019 - It's About Time! The last time you heard from this reporter we had wrapped up 2018 with a shiny bow with a delightful Yankee Swap breakfast at Spring Hill. Then we were off for a couple of weeks, rang in the New Year, and on January 10th had our first meeting, but your club secretary was splashing in the Caribbean at that time. Richard had another creative meeting where each Rotarian was put on the spot to talk about Rotary. I heard it was great. Many thanks to those who manned the Food Pantry on the first Thursday in January, too. January 17th, thanks to Brandon Elsemore, we had the pleasure of meeting Cara DellaRusso (sp?) and her dog Mac aka Macaroni. Cara is a South Berwick resident who runs two businesses, On-Demand Home Services, a cleaning company, and Cara's Pet Care and Training. She possesses expertise in canine learning theory (yes, that's a thing) which uses classical conditioning and operant conditioning concepts to properly train a dog. Once you understand their psychology (dogology? ), it is possible to obtain the results you desire in a dog's behavior. Just understand what they want and what they like and give them that when they do what they are supposed to. Kind of goes with most everybody, doesn't it? This coming Thursday, January 24th, Hap Moore has invited the folks from House of Hope in Somersworth to talk to us about the wonderful things they are doing there for homeless women and children. Well worth attending. The Coast Guard families are in great need of food due to the government shutdown and Robin requests that members bring in food items at the next meeting and/or money to donate and she will shop for what they need and bring everything to those she knows who are helping those families at this difficult time. Rotary shirts and hats are available. See Brenda Gagne if you'd like to buy any. Many thanks to Brenda for arranging this. DON'T FORGET THE BIG CLEAN-UP OF ROUTE 236 ON SATURDAY, NOVEMBER 10TH. (Rain date will be Sunday the 11th.) Meet at the Central School and wear clothing that will make you more visible (i.e. neon colors, not clown costumes or bikinis). Thank you to Mike Lassel for representing us at the upcoming district training session on membership and the Rotary Foundation. We have a new potential member. Brandon Elsemore has attended a couple of meetings and submitted his application for board approval. Please introduce yourself to Brandon and give him a warm welcome if you see him. Our board meets on Monday, November 19th, at the offices of Civil Consultants. On that note, coming up on Thursday is our Rotary Foundation presentation and Rotarian Larry Furbish will be there to regale us with RF stories. Seriously, this is our opportunity to support RF as a club, so please bring your checkbooks or plan to make a donation on-line to RF. Any amount is welcome, we just like to see 100% participation from our members, if possible. November 15th's speaker will be provided by Derek Ahl. No meeting Thanksgiving Thursday, of course. At long last (he was unable to come last time we scheduled him), the famous Bruce Cultrera of Seacoast Helicopters was able to take us into the wild blue yonder via his NH Chronicles video and his stories about the helicopter and aeronautics business. Bruce is a Marshwood graduate who then joined the Air Force and continued his studies at the University of New Hampshire and spent a few years in business, working mainly with aerospace defense companies. Then he started his own business as a management consultant and dabbled in real estate, too. It was during that time that he experienced the thrill of helicopters and has been hooked ever since. He created Seacoast Helicopters and it has now grown to 5 helicopters, 3 planes, 14 pilots, FAA certification, licensing for various flight options, and he has expanded into Portland. He operates basically under 5 business segments/profit centers: 1) flight training (by the way, there is a serious shortage of pilots right now, especially fixed wing pilots, so if you know people who are wondering what to do they might consider this career), 2) scenic touring (seasonal) which will hook you on helicopter flying (just ask President Richard) and Bruce promises you will not need an air bag, 3) air taxi services in case you'd like a unique and hassle-free mode of transport to your destination, 4) external load business for those who need to transport cargo to places, and 5) government contracting to very remote sites. We ran out of time way too soon to hear more about his exciting business. Perhaps we can invite him back? -- Any takers for a holiday house party like the ones we've had in the past? -- A number of members are planning to invite prospective new members to upcoming meetings - the more the merrier! Town Manager Perry Ellsworth spoke about what is happening around town as he continues managing South Berwick now in his 8th year at this post. Current highlights include the ahead-of-schedule and economical construction of the new town police station, the setting of a good bond rate for the town, police dispatch moving to Sanford, and continued debate about marijuana rules and regulations for the town. Perry has enjoyed the diversity and civility program with sister city Tuskegee, Alabama. Issues regarding employment and sustainability of our workforce are apparent all over the state. In our case, we have employment opportunities in the town and cannot draw from our most nearby cities and towns because they are in NH and we must hire Mainers for municipal positions. We are starting to see younger people filling government posts as older workers are leaving. The goal is ultimately to have age and gender diversity. Thank you, Perry, for all you do for South Berwick. You run a calm and efficient ship, which we all appreciate. Smooth sailing, mostly. We welcomed back...wait for it...JIM HOWELL! He came as a visitor but it sure would be nice to have him rejoin us, don't you agree? Jen Wing from the Admissions Office of Berwick Academy was present as their designee at this meeting. For future planning, our speaker on Thursday will be Mike Lassel talking about projects around South Berwick. Get ready for our District Governor. He will be visiting our club on September 27th. Plan to be there so we can show off all our wonderful members. An upcoming fundraiser in the near future will be the electronics recycling fundraiser that Jeremy is organizing. It looks like that could be in mid-November, so start stockpiling your defunct electronics to be dumped that day. Volunteers will also be needed to welcome visitors to the new Story Walk at Douglas Woods during Eliot Festival Day on September 29th. We will find out what that entails, but at the least we will share information about Rotary to visitors to the trail. Our club, with our towns' librarians and the Great Works Regional Land Trust, helped make this possible, and that is why we will be there. We received a check for $1800 from The KIttery Block Party! We had no idea why, but were thrilled. 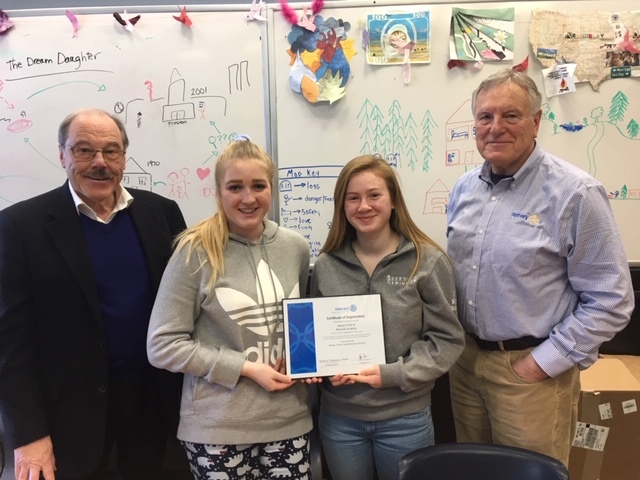 Later we learned that Grace Jacobs, the Marshwood Interact advisor, had applied for one of their grants to help fund the upcoming Interact service trip to Peru which will include some students from Traip Academy, too, so the mystery was solved. The funds were to help defray the costs of that service trip. I am not 100% sure that this web pointer will work, so see Carolann for more details if it doesn't get you to the donations area. Her walk is Saturday, September 15th. We are delighted to announce that Derek Ahl has officially fulfilled the requirements to become a member of the club. His initiation ceremony is imminent. All the rooms at the Mount Washington Hotel have been reserved for the multi-district conference, but there are still other places to select for your lodging if you intend to go. It's certainly not too late to register. The first meeting in December will be our club elections. If you care to serve as an officer, please see Wes Kennedy. Be prepared to help serve Thanksgiving dinner to the senior citizens on Monday, November 20th, at the Community Center. The Marshwood High School blood drive in which Interact is very involved will be on November 7th at the school from 1:00-6:00 p.m. They need donors. Also, please plan to go out to eat at Johnson's Restaurant in Berwick on Wednesday, November 8th, from 4-8 p.m. Tell them you are there for the MHS Interact service trip and 10% of the cost of your meal(s) will go towards their fundraiser. Interact members will be traveling to the Dominican Republic in April to replant coral reefs. How exciting is that? Please support them. Interact is also collecting canned goods on Halloween which they will bring to the food pantry on the Thursday after Halloween. They also had a successful Purple Pinky drive for Polio Plus and, on October 27th, prepared and served 60 meals at Crossroads House. Molly Bannon update: She is in Cleveland awaiting another transplant/procedure for her ailments. She has had a rough time of it since the stomach transplant but keeps her spirits up. We have received $275 in donations in honor of Steve Sanborn. This will be used for RYLA students, a favorite program of Steve's. Donations in memory of Richard Currier will go towards the scholarship fund established for Matt Kenney's children, following the untimely passing of this pharmacist who had worked with Richard at the South Berwick Pharmacy. 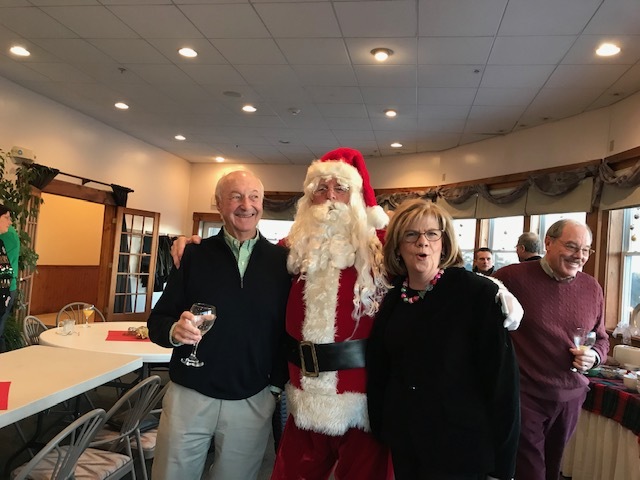 The Rotary Club holiday party on December 17th at the Harmons' home will begin at 3 p.m. and friends and members past and present and potential are invited to come, along with significant adult others. There will be fine food (which we all will contribute) and special entertainment provided by Skip Cousens' sister, the singing duo "Boogie Two Shoes". It would be great if everyone brought $10 to help defray some expenses of the party. Richard Donhauser invited our guest, Lauren Cultrera, to be our mystery speaker. We had to guess her unique profession. Although she appeared to be a normal 31-year-old Marshwood High School graduate who is getting married in less than two weeks, she is extraordinary. After a number of pointed questions we guessed her "line" - she is a serious dragster who spends at least half of her free time competing in drag races. Although she works in her father's business taking care of racing vehicles, she competes often, reaching speeds of over 160 m.p.h. in her racer. Her family and fiance support her every step of the way and she is a competitive racer who sometimes finds herself in the winner's circle. Her brother also competes. It is not a matter of sitting in a car, turning the key in the ignition and driving away. She must withstand the heat and vibrations and make calculations so she precisely crosses the finish line at the predicted time, down to the last millisecond. She has been doing this for years and absolutely loves it. SEE YOU ALL ON THURSDAY TO HEAR AND SEE RAY'S PRESENTATION. This was a club assembly and we discussed the Geography Quiz Night, the Citizens of the Year event, our Out of the Shadows fundraiser this past spring, the Crutches for Africa project, our by-laws, the October Polio Plus walk across the Memorial Bridge, the dictionaries project, the Thanksgiving dinner we will host in November, the trees we will be planting in April, a clean water project in Guatemala, our holiday party at the Harmons' home, our Yankee Swap holiday meeting at Spring Hill, and reminded folks that the board would be meeting the following Monday to take up these items and all were welcome to attend. The club voted to help fund the 4 Marshwood Interact students attending the United Nations/NYC trip in early November. At our October 5th meeting the 4 Interact students who participated in RYLA will be our speakers. At this meeting our generous club members also donated to the two Rotary Foundation (RF) Hurricane Relief Funds and these donations will be matched by the club and will be applied to our club's annual RF commitment. President Skip Cousens reviewed the by-laws that needed to be addressed due to some slight inconsistencies with the way we have been managing the club, and after discussion the board approved the changes. A new set of by-laws will be provided to club members soon. The Out of the Shadows fundraiser netted $14,677.76, according to Treasurer Kim Brooker. After deducting the 10% that goes back to the club for other projects, that leaves $13,209.94. Robin Wheeler asked to reimburse Pastor Beth $1000 now for expenses she paid out of pocket for Out of the Shadows, and the remainder will be presented at the October 5th club meeting where we will invite folks from that organization and reporters to cover this. We will prepare a press release that will also mention the other community fundraisers we have had in the past and how they have helped our communities (AED's, feeding our neighbors, scholarships, etc.). So far $710 has been raised for the Hurricane Relief fundraisers. We will be hearing from the folks organizing the clean water project in Guatemala (Bill Chadwick and the Westbrook-Gorham Rotary Club) to see if that is what we want to support for the Geography Quiz Night which we hope to have in March. We made a decision on whom we wish to honor at the Citizens Appreciation Dinner in April. We will present this to the club for their feedback. We will reinstitute the Buddies List to make sure we take good care of our fellow members. We hope to have a presentation about club membership sometime soon to help clarify what it takes to add new members to the club. We will gather more details on the Polio Plus Bridge Walk to present to the club. Next Thursday is Rotary After Hours, tentatively at the tavern at the Links at Outlook in South Berwick starting at 5:30 p.m. Come for the fun. Bring someone to meet the great people. DON'T GO TO THE COMMUNITY CENTER THAT THURSDAY, of course. September 14th is Club Assembly. Should be a busy one. We are making a goal for each member to bring at least one guest to a club meeting or event once this year. There will be a Bridge Walk to support Polio Plus again in October. If you can't do it, then support one of the members who will be. We are working on cleaning up the by-laws. Stay tuned and be ready to discuss and vote on this. Our speaker today, brought to you by Jeremy Fogg, was his friend George Beland. George is a woodworker who started this endeavor in 2002 when he made anything with wood. He cooperated with a wood shop at the Button Factory in Portsmouth, sharing tools and expertise. He most prefers being a furniture maker but does mass production of all sorts of items made of wood. He has mastered the technology to be able to produce items in bulk according to custom specifications. He has some employees and now owns a small shop in Eliot, Maine. Although he can hand-tool, he prefers to use machines to make his products and is an expert in CNC (computer numerical control) machines. We saw some of his furniture and novelty items he has produced. His biggest challenge is marketing his work. Be back in a couple of weeks. August 31st will be our After Hours Thursday. So far, that means that we will not be meeting on that Thursday morning. We will be discussing the venue at our Thursday meeting. The following week will be another exciting speaker for September 7th. September 14th will be Club Assembly and we have many important matters to discuss. We can use Berwick Academy on April 20th for our Citizens Appreciation activity - whatever we decide to do for that - if we'd like. The fireside chat that took place on August 16th at President Skip's house was great, and more people need to experience this, so there will be a mini-fireside chat sometime soon during a club meeting (perhaps even at the next club assembly). Thanks to Warren Spencer and Skip for pulling that together. The Safe Passage Grant in Weymouth, MA is still trying to complete the process which will allow us to send out the funds we raised at the Geography Quiz Night and from the Interact club. Since we are looking for a project that addresses the issue of clean water in order to complete our Pyramid of Peace, we might consider a project out of the Westbrook-Gorham Rotary Club to provide clean water to a village in Guatemala. Other ideas, anyone? Following the club meeting of August 17th a number of members helped clean up after the previous evening's Lanternfest at Spring Hill. Thank you to all those volunteers. That was good work provided by the Rotary Club! Dave Underhill, our District Governor, gave us an overview of what we have in store for this Rotary year. It includes 1) continuing the fight to eradicate polio, 2) dealing with substance abuse recovery, 3) undertaking clean water projects, 4) addressing issues in education, 5) helping our local communities, and 5) using the Pyramid of Peace as a guideline for what we undertake this year. There are now 40 clubs in our district. Lots of us being "people of action". Perhaps our biggest weakness is not telling our own story. We need to take credit for what we do so people will want to join us. Membership drives are important to be able to do more and more good work. We will also be planting trees, with seedlings arriving sometime in the spring. This year's motto is "Making a Difference", which is what each of us does. Coming up later is the Multi-District Conference at the Mt. Washington Hotel on May 4-6. Five districts will be there and there will be a youth services conference then, too. And the president of all of Rotary will be there! A great opportunity for fellowship and fun. We should try to make this a major club activity for fellowship, too. We should also plan on doing a polio-awareness-raising project in October. The Bridge Walk in Portsmouth is a good way to do that. By the way, if you make a donation of $25 or more to Polio Plus via the district's recent promotion, you earn a chance to go to Seattle, all expenses paid, for the Polio Plus Conference. Check out the district website for details. At the Board meeting we discussed the need to review our by-laws so they are more in line with how we actually do things in the club. We also were asked by the Pumpkinman Triathlon director to provide volunteers for their events during September 9-10. They are in great need of people to help. We brainstormed ideas for our Citizens Appreciation event and decided we need to open this to discussion by our club members. We reviewed the upcoming club activities including a request to have another blood drive during the December-January time frame. We hope to be able to distribute the funds for Safe Passage and Out of the Shadows once we have reviewed the financial reports that our new treasurer is working on with the help of Steve Sanborn. Lastly, we discussed how we might meet our membership goals to increase the size of the club. We are down to 26 members and would like to have 35 by the end of this Rotary year. Lofty goals, but nothing is impossible if we try hard. THIS MESSAGE WAS RECEIVED FROM MOLLY'S MOTHER. I am happy to update Molly's story - I may forget things as it is quite a story. Hopefully, my writing is delicate! Molly was transplanted with small bowel and colon on November 6, 2015. The transplant was completed over two 15 hour surgery days. She was slated to leave the hospital after an incredibly fast recovery two weeks from the second surgery, but things took a turn for the worse quickly. Molly had increasing pain and dangerously high fevers. It wasn't rejection even though she had issues with that, too. After suffering for a few weeks, the team operated, again, and found she had a devastating cavity infection. They noticed that the donor lymph nodes had become quite enlarged and very hard - they feared a transplant induced Lymphoma but it was not- which the doctors had never seen before. She has since lost all of those lymph nodes as they have almost completely disappeared. Another uncommon complication she had is something called Mesenteric Sclerosis. This is a cast like scar tissue that forms over the mesentery, which is the blood and nutrient supply to the small bowel. It can happen from trauma or is sometimes seen in patients from countries where the staple meal is rice. I have these thoughts and no one challenges them as Molly's complications are very rare and she is the first of her health issues to be transplanted, so I am lucky the team listens to my theories/questions. Now I realize I am playing "arm chair doctor" but in my defense, I have a lot of experience and knowledge regarding these issues and my girl. I believe the trauma of transplant sparked the sclerosis as Molly does not scar due to the Ehlers - Danlos Syndrome. Mesenteric Sclerosis is a chronic, very painful issue that can only be removed surgically...but, in Molly, grows back within a few weeks. It has been removed only twice and only because surgery was required for other issues. The last time it was removed, the doctor said it had become so hard, he removed bone from the mesentery. Image your intestines being encased in a plaster shell... Molly has had over 30 gut surgeries so she will have to wait until transplant to have it removed as surgery is proven harder to heal. In the meantime, she is in increasing pain. Hopefully, this will not occur with the next transplant! After this third surgery in 5 weeks, Molly's kidneys suffered. She gained over 40 pounds of fluid weight resulting in significant skin damage. She has always had stones, but now has Chronic Kidney Disease. Luckily, it is stage three so no need for dialysis yet. Unfortunately, this is the nature of the beast for some intestinal transplant patients and we figured this might happen. I am quite vigilent in giving her IV fluids which helps in between kidney injury episodes. The doctor has a thought or two regarding Molly suffering since transplant. He is thinking that she may be in a different type of rejection. No one has had an intestinal transplant having suffered with Indeterminate Colitis and EDS Type III so we do not have any history to compare cases. She is also only the third patient to receive the rectal pull through. There is probably permanent nerve damage due to the very bad cavity infection immediately post transplant that went on for a few weeks. Hindsight being 20/20, Dr. Kareem thinks he should have replaced Molly's stomach, duodenum, both intestines and pancreas the first time. My sweet girl may also be listed for a liver. She has fatty liver probably due to the years of IV nutrition and meds. She has Encephalopathy which causes confusion, memory loss, lack of concentration, extreme lethargy and dementia like symptoms. It is most likely due to a high manganese level that the liver is not filtering. The deposits settle in the brain and may or may not dissipate. We are very hopeful that this 5 or 6 organ transplant will allow Molly a better quality of life even if it's just for a short time. We are very realistic in regards to the outcome but our hope and belief in the doctors keeps us positive about her future. I had an interview at The Cleveland Clinic and it looked very promising, but the job was given to someone already working on that floor. When the team heard I was looking for work, I was nicely told Molly is too sick for me to work. She has declined greatly the last three weeks :( and now weighs about 100 pounds. In the meantime, Molly -when she feels up to it- and I keep busy volunteering here at The Transplant House of Cleveland and mentoring patients and caregivers. I am also one of a small group working on a caregiver's handbook for all the transplant teams at the clinic. I was very honored to be asked to help write this important handbook! I know I continue to thank you and the Rotary members for helping my family but we really do appreciate any and all help. We are also tremendously thankful for our community and The Transplant House. I am not sure how we will financially get through this next transplant but I must believe we will land on our feet somehow. Please feel free to reach out to me anytime, read my blog on CaringBridge.net and check out The Transplant House of Cleveland's website. I may even be able to send a picture or two of Molly if you like! If anyone from the Rotary would like to ask questions, I am happy to respond! I hope you enjoy the rest of Maine's summer...we sure do miss our little slice of happiness called home in Eliot! At the last meeting, President Skip reminded us that the District Governor will be visiting our club on August 17th and he hoped all could attend to give Dave Underhill a fine welcome. One of the projects to be undertaken this year will be planting a tree for every Rotarian, so we hope to have around 30 this year, so that means deciding where and how we will do this. We will contact the towns' conservation commissions and land trusts and hope to involve the Marshwood Interact Club, too. August 16th is South Berwick's Lanternfest at the grounds of Spring Hill Lodge. This is the evening before our Thursday club meeting, so, like last year, we will be helping with the clean-up the morning after. So, after our Rotary meeting we hope to have many volunteers drive over to Spring Hill to make quick work of the clean-up. We have received donations in memory of Richard Currier. Rotary was an important part of his community life and he was always the first to volunteer. Our speaker was Warren Spencer, due in part to a mix-up caused by your club secretary, but it was most interesting hearing about Warren's hobby. Since he was introduced to it by a Navy chief from the Portsmouth Naval Shipyard, Warren has been an avid wood carver. He generally finds a good piece of wood, mostly from old barns and with no knots, and, with his trusty kit of tools, carves works of art. These can be eagles, faces, items from nature, or whatever strikes him as worth carving at the time. Some of his works are on display in prominent places, including the State House. We got to see the carvings that he happened to still have at home, which meant they did not meet his standards for gifting or displaying, but they were still demonstrative of the detail and beauty he creates from wood. Just when you thought you knew someone, you discover talents he had you were unaware of! Thanks for sharing, Warren. South Berwick-Richard J Currier passed away unexpectedly at his home on Friday July 21st 2017. Richard was an important part of our community both as an active Rotarian and former proprietor of South Berwick Pharmacy. He was an avid runner and his waves hello will be missed. He was a devoted father, grandfather, brother, son, and friend. Richard leaves behind two children Lorne Currier, Brooke Frank, and son in law Lee Frank, grandchildren Addison and Annabelle Frank, sisters Cynthia Nickerson and Linda Nadeau, parents Richard and Jean Currier, as well as his nieces and nephews. A memorial service will be held on Friday July 28th at 6:00 pm at the First Parrish Federated Church in South Berwick ME, with the Rev. Linda Hìrst officiating. Care for the Currier family has been entrusted to the JS Pelkey Funeral Home . On August 17th, plan to attend the club meeting as our District Governor, Dave Underhill, will be making his annual club visit. The Rotary and Boston Red Sox will have a game honoring our organization on September 13th at Fenway Park. If you are interested in attending, check out the district website for further details. We have tentatively set August 16th at Warren Spencer's house for a fireside chat for new-ish members and those who want a refresher course on what we are all doing in Rotary and why. This year our district's goal is to increase membership by around 150 members. We encourage each member to invite one guest to a club meeting this coming year and see what develops. We are so lovable that this is bound to increase membership! It was a very subdued meeting today as we dealt with the passing of Richard Currier. Next week we will definitely have a real speaker for the morning program. If you can, please plan to attend the memorial service tomorrow, Friday, at 6 p.m. at the First Federated Church in South Berwick. South Berwick - Richard J Currier passed away unexpectedly at his home on Friday July 21st 2017. DANCING TO THE MUSIC OF "SOMETHING IN THE WATER"
With a large and exuberant crowd in attendance we honored Wesley E. Kennedy as our 2016 Citizen of the Year on Saturday, June 4th, at Spring Hill Lodge in South Berwick, ME. This outstanding person has been instrumental in improving our communities in so many ways. From serving as Superintendent of Schools for MSAD #35 and receiving the title of Superintendent of the Year in 2000 to serving on numerous boards and citizen groups, his legacy includes bringing about the building of the new Marshwood High School, the South Berwick Public Library, capital projects at Wentworth Douglas Hospital, and providing guidance and manpower to numerous community projects. So many fans of Wesley Kennedy came to this testimonial dinner and both lauded and roasted him. Proceeds from the event went to the Clifford Ham Rotary Scholarship Fund. Many thanks to all those who attended and spoke and donated. It was a wonderful evening!